Enroll in Bank of America’s online banking by creating a BofA login. 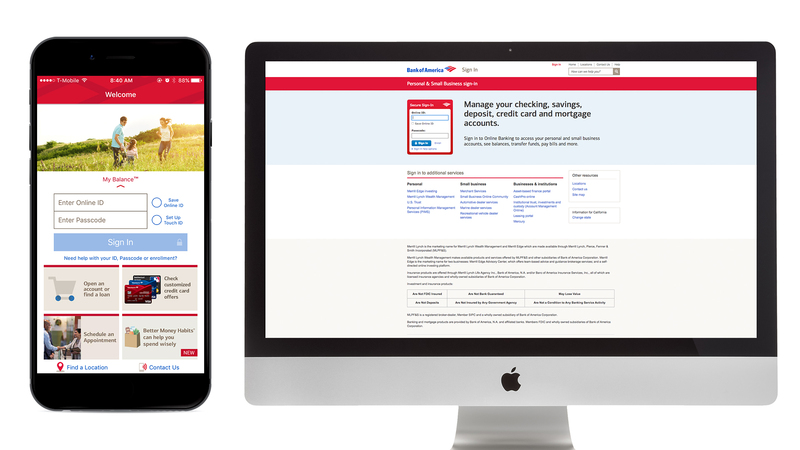 With over 22 million active mobile users and 34 million active accounts, it’s no wonder Bank of America offers user-friendly online and mobile banking for customers. To securely access your Bank of America account, follow these easy steps to set up and log into your bank account online. To take advantage of all online banking has to offer, create a Bank of America online login that includes a unique online ID and a passcode. Use the online ID and passcode you create to access all of your accounts. Visit the Bank of America home page. Click “Enroll in Online Banking” under the top right search box. Enter any one of your accounts, credit cards or ATM/debit card numbers in the box followed by your Social Security number. Choose a unique ID and passcode. You will be prompted to set up security questions to answer should you forget your online ID or passcode. It’s simple and convenient for online users to access their accounts using their Bank of America online banking login from anywhere on the website. Go to the Bank of America home page. Enter your online ID and passcode. Click “Sign In” at the top right corner. Select the current state you live in on the drop-down button. The Bank of America mobile banking app is free and available for users of iPad, iPhone, Android and Windows 10 devices. Download the Bank of America app from Google Play or iTunes. For the full list of mobile banking and online banking features, visit Bank of America’s online banking home page. Editorial Note: This content is not provided or commissioned by the bank advertiser. Opinions expressed here are author’s alone, not those of the bank advertiser, and have not been reviewed, approved or otherwise endorsed by the bank advertiser. This site may be compensated through the bank advertiser Affiliate Program. What Are the Best Banks for Millennials? With more millennials banking online, banks are getting competitive with digital offerings. Stop paying fees with your hard-earned money — open a free, online checking account today. How Many Bank Accounts Can You Have at One Bank?